MONTREAL, Oct. 02, 2018 (GLOBE NEWSWIRE) -- HPQ Silicon Resources Inc (“HPQ”) (TSX VENTURE:HPQ) (FRANKFURT:UGE) (OTC PINK:URAGF) is pleased to inform shareholders that a newly completed geophysical and geological studies along the Rang VI road on HPQ Beauce Gold Fields subsidiary Gold property located in St-Simon-Les-Mines, Quebec has identified a 1.5 km northeastern extension of the previously identified major fault line (May 11, 2017 release) beneath the Beauce placer gold channel. Furthermore, the geophysical and geological study along the road has also identified additional exploration targets for gold and base metal sulphide mineralizations. The Gilbert River basin (about section 3,200m on Figure 1) is marked by a strong contrast of electrical resistivity values on both sides of the river believed to represent a thrust or shear contact between sedimentary and volcanic rocks. Rocks south of the river are dominantly sedimentary and show the presence of formation conductors present mostly in synformal fold structures while north of the river the rocks are generally volcanic in origin, including volcaniclastic strata, are generally more resistive, and the conductive units narrower and shallower. This discontinuity corresponds also to the position of a linear anomaly of the total magnetic field and its tilt derivative field, which suggests the presence of a magnetic discontinuity related to the presence of a major fault zone, which the Gilbert River follows (Point F3 on Figure 1). Parallel to the Gilbert river, under 15 to 40 meters of overburden, hosts a placer channel that is a six kilometre long unconsolidated gold-bearing sedimentary unit (a lower saprolite and an upper brown diamictite). Textural observations (angularity) of gold nuggets suggest a relatively proximal source and therefore a short transport distance (NI 43-101 Beauce Gold Property Report, Violet July 4 2018). 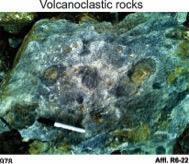 The survey data shows the presence of several conductors in the rocks from the Beauceville Formation (C3, C5, C6, C7, C8, C9, C10 and C11). Some of these conductors are related to graphitic shales (C3, C6, C7) but other are associated with magnetic anomalies (C8, C9 and C11) and could be exploration targets for massive sulphide mineralization. The rocky outcrops present along the Rang VI Road have also been mapped. 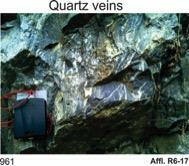 Several generations of quartz veins, sometimes associated with sulphides, intersect the rocks of the Beauceville Formation in the northern part of the Rang VI road. These veins testify to hydrothermal processes affecting the sedimentary and volcanic rocks of the area. In addition to specifying the structural context of the St-Simon-les-Mines gold sector, the geophysical work of 2016 was extended in 2017 to the north-east to document the deep geology of the northern part of the Beauceville Formation. This area is characterized by a greater proportion of volcanoclastic and volcanic rocks and a geological context similar to that of the Champagne massive sulphide deposit in the St-Magloire area (Bellechasse gold belt). The audiomagnetotelluric data of the St-Gustave road section suggest the presence of a large conductor (conductor IV) with an estimated thickness of about 50 m and vertical extension in the order of 400 m (Fig. 1). This structure could correspond to a massive polymetallic sulphide mineralization. Additional work is planned to specify the geometry of this conductor. The work, carried out under the supervision of Professor Marc Richer-LaFlèche, Ph.D., P. geo, from INRS-Center Eau Terre et Environnement of Québec conducted a multidisciplinary geophysical and geological study to document the deep geological context of the Magog Group and, more specifically, of the Beauceville Formation (Bellechasse gold belt) under the St-Simon-les-Mines gold placer. A 5.6 km long Audiomagnetotellurics (AMT) survey (113 stations per 50m) was conducted as well as a Frequency Domain Electromagnetic (FDEM) survey (112 stations) along Rang VI road. The purpose of this survey was to assess the deep geology of this area and to verify the probable northeasterly extension of deep structures detected during the AMT survey conducted in 2016 on St-Gustave Rang Road (May 11 2017 PR). The study of the geology and deep geophysics of rocks of the Beauceville Formation in order to improve the structural and metallogenic understanding of the region using AMT and FDEM method is used to locate potential fluid circulation corridors (faults) responsible for the emplacement of orogenic gold mineralization and to detect strong magnetic conductors potentially related to VMS or SEDEX mineralizations. Marc Richer-LaFlèche PhD, P. Geo, is a qualified person as defined by National Instrument 43-101 and has reviewed and approved the technical contents of this press release. BGF is a wholly owned subsidiary of HPQ Silicon into which HPQ gold assets were transferred. Subject to approval by TSX-V, HPQ is in the process of listing BGF as a new public junior gold company, following the approval by shareholders during HPQ AGM held on Aug. 10, 2018, of the proposed terms of the plan of arrangement. The Beauce Gold Fields project is a unique, historically prolific gold property located in the municipality of Saint-Simon-les-Mines in the Beauce region of Southern Quebec. Comprising of a block of 152 claims 100% owned by HPQ, the project area hosts a six kilometre long unconsolidated gold-bearing sedimentary unit (a lower saprolite and an upper brown diamictite). Textural observations (angularity) of gold nuggets suggest a relatively proximal source and therefore a short transport distance. The gold in saprolite indicates a close proximity to a bedrock source of gold, providing possible further exploration discoveries. The property was also hosts numerous historical gold mines that were active from 1860s to the 1960s (see HPQ SEDAR-filed report). HPQ’s goal is to develop, in collaboration with industry leaders, PyroGenesis (TSX-V: PYR) and Apollon Solar, that are experts in their fields of interest, the innovative metallurgical PUREVAPTM “Quartz Reduction Reactors (QRR)” process (patent pending), which will permit the transformation and purification of quartz (SiO2) into high purity silicon metal (Si) in one step and reduce by a factor of at least two-thirds (2/3) the steps required to transform quartz (SiO2) into SoG Si. The pilot plant equipment that will validate the commercial potential of the process is on schedule to start mid-2019. 04/04 ENERGY TRANSITION : HPQ - Apollon Solar Extend Agreement Regarding the Developme..
03/05 HPQ SILICON RESOURCES : Gen2 PUREVAP(TM) Testing of Tapping Section of Pilot Pla..
02/27 PYROGENESIS CANADA : HPQ Latest Gen2 Progress Report Confirms PUREVAP QRR Abilit..
02/26 PYROGENESIS CANADA : HPQ Latest Gen2 Progress Report Confirms PUREVAP™ QRR..
02/01 HPQ SILICON RESOURCES : Completes Beauce Gold Fields Plan of Arrangement Spin Ou..
2018 HPQ SILICON RESOURCES : Announces the Record Date for the Distribution of Beauce..
2018 HPQ SILICON RESOURCES : Beauce Gold Fields Closes the $550,000 Concurrent Privat..